Spring can be a welcome relief from the cold weather of winter, especially on outdoor or partially outdoor job sites. However, as much as your human employees may appreciate the more temperate weather, some of your equipment may struggle to operate as the thermometer climbs. Spring and early summer can be particularly difficult for industrial machinery, including air compressors, due to the sudden fluctuation between cold and warm weather that can occur numerous times during the season. This weather change can occasionally cause serious air compressor issues. As the weather warms up, you may notice any of the following six seasonal issues. 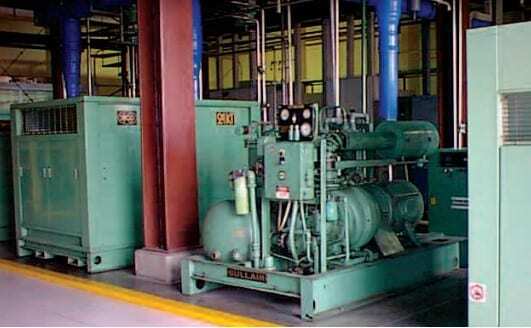 Your industrial air compression system uses air or water to offset the heat generated during the compression process. Higher ambient temperatures require additional cooling capacity. Check air cooled heat exchangers for dirt build up and clean if necessary. Check water supply and water cooled heat exchangers for scale and dirt build up. Insure adequate water is available at the compressor for proper cooling. Warmer air also holds more moisture which can infiltrate the airlines. We’ll discuss more in detail in section six. Excess heat can cause or contribute to numerous compressor problems, many of which are on this list. One way that heat can damage your compressor is by compromising the structural integrity of small components, like gaskets and hoses. If you have a damaged hose, valve, or gasket, the compressor may also develop an oil leak. If left unaddressed, an oil leak can corrode other components and affect the performance of the entire compressor. In addition to specific parts failing in excess heat, warm weather temperatures may cause excess wear and tear during normal air compressor use. This compressor problem may not be obvious while you’re using the machine or even during the summer that the damage occurs. Instead, unusual wear and tear generally leads to a significantly shorter unit life and a need for more frequent repairs. The best way to minimize wear and tear is by scheduling routine service calls so that heat, ventilation, and wear issues can be addressed as soon as possible. In addition to appropriate water levels, your air compressor needs sufficient oil levels to lubricate the moving parts and reduce the risk of overheating. High temperatures can require massive amounts of extra oil. In fact, if the ambient temperature in your compressor enclosure or around your air compressor rises 20℉ over preferred working temperatures, the change could reduce the oil’s life by half. This situation can dramatically increase your oil costs as well as the risk of long work breaks necessitated if the compressor overheats and switches off. Many of the warm weather problems on this list can cause a single result: an automatic shutoff. These shutoffs occur when the internal temperature of the compressor becomes so high that continued use would compromise the components. You may need to wait for the compressor to cool off completely before turning it back on. If multiple shutoffs occur, do not attempt to use the unit again until it’s been evaluated by a repair expert. Too many shutoffs can lead to motor and electrical problems that may be hazardous to your employees. While water is an integral part of the compression process, you don’t want water to infiltrate the wrong parts of your unit. If the unit’s drainage cannot effectively get rid of the moisture in the air lines, this may cause reduced oil life and premature failure. This excess water can occur due to high heat or high humidity. It’s important to account for both of these factors to protect your compression system from water infiltration. Spring is also often the right time for a routine inspection, even if none of the seasonal issues listed above have occurred. Schedule an appointment with one of the experts from the Compressor-Pump & Service, Inc. team to ensure that your air compression system continues to run efficiently regardless of the season.